Don’t have time to sit down and eat breakfast? 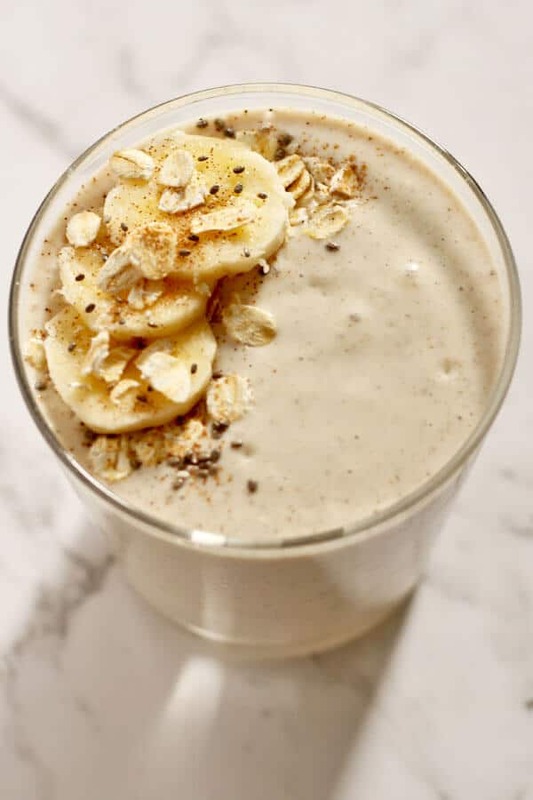 Whip up this Banana Oat Smoothie for a satisfying breakfast on the go. Just dump, blend and run! I like my mornings slow. My perfect morning starts with hitting the gym or going for a long walk, then coming home to cook up a decent breakfast, spend time with my husband and linger over a quiet cup of tea on the couch. And most days I do exactly that! But some days this just isn’t possible. Some days I wake up late, miss my workout and need a breakfast that I can grab and go while I literally run out the door without a shower. And on days like those I make these Banana Oat Smoothie. It’s a dump, blend and run recipe. It’s ready in 2 minutes (yes I timed it). And you can easily double, triple etc. the recipe if you have more mouths to feed! I like to think of this recipe as my Banana Oatmeal in liquid form! It’s a little more filling than traditional banana smoothies and will keep you feeling satisfied until lunchtime. And the best part… I bet you already have all the ingredients for this on hand! This is probably one of the easiest smoothie recipes with just 6 everyday ingredients. Don’t have something on hand? I’ve added a bunch of suggested substitutions below. Milk: Choose a milk you actually like. Lately I’ve been using soy milk for all my smoothies as I find it doesn’t really change the taste of the smoothie at all. Yoghurt: I typically use either vanilla yoghurt or a slightly sweetened plain greek yoghurt in my smoothie recipes. If you are using an unsweetened plain greek yoghurt, you may wish to add a tsp or two of your favourite liquid sweetener. You could also use coconut yoghurt or omit yoghurt entirely. Vegan / Dairy Free: Use your favourite non-dairy milk and use coconut yoghurt, or omit yoghurt entirely. Fresh Vs Frozen: I love using frozen fruit and vegetables in my smoothie recipes, as I find they not only help keep the smoothie cool but also help to thicken it. I’ve added some info and tips for freezing your fruit and vegetables below, but if you only have fresh on hand this is absolutely fine to use. Chia Seeds: These are my go-to smoothie booster / add-in as they thicken up the consistency and don’t taste like anything. Chia seeds are rich in fibre, omega-3 fatty acids and protein, as well as rich in minerals such as calcium and magnesium. BUT if you don’t have them just omit them completely and add a little less milk in, or substitute for your favourite smoothie booster. Are you ready for this? Because this is really the easiest recipe. All you have to do is add the ingredients in the order they are listed above to a high performance blender, and blend until smooth. Can I make this smoothie in advance? If you’re really pressed for time you can whip this smoothie up the night before and leave in the fridge. It will thicken overnight so you’ll need to stir in a little more milk in the morning before you drink it. And by the time you do that, you probably could have just made it the day of 😉 I promise all you need is 2 minutes and you’ll be out the door. 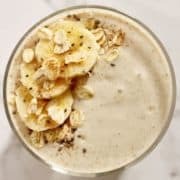 If you’ve tried this Banana Oat Smoothie I’d love to hear how you enjoyed it! Pop a comment and a star rating below! You can also FOLLOW ME on FACEBOOK, INSTAGRAM and PINTEREST to keep up to date with more delicious recipes. Don't have time to sit down and eat breakfast? 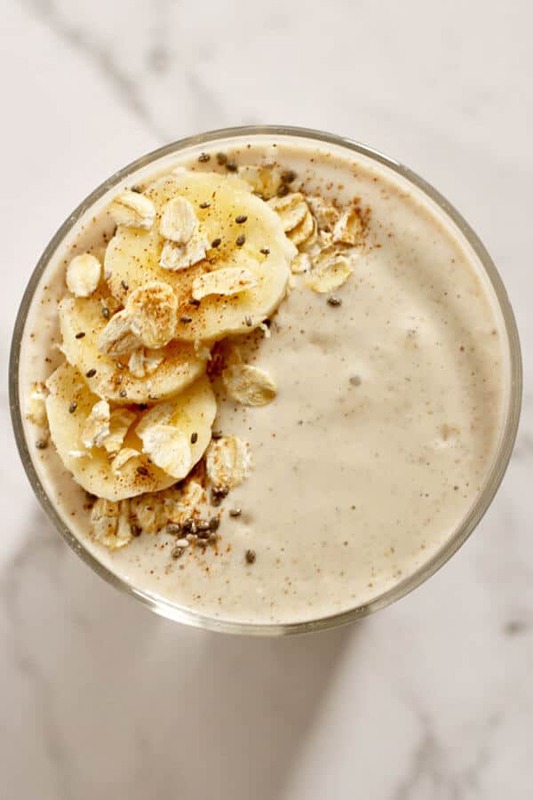 Whip up this Banana Oat Smoothie for a satisfying breakfast on the go. Just dump, blend and run! 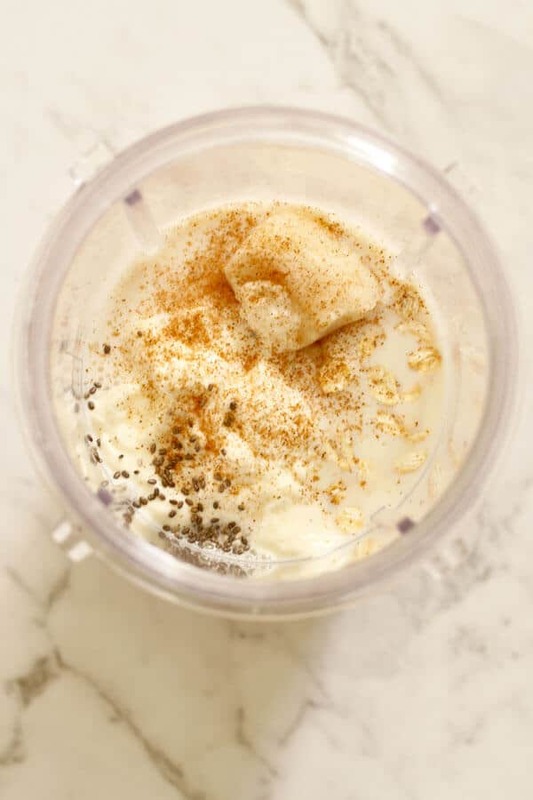 Add all ingredients in order listed to a high speed blender, then blend on high until ingredients are well combined and the mixture has a smooth and creamy consistency. Milk: Choose a milk you like. My favourite at the moment is soy. Yoghurt: Vanilla yoghurt or sweetened greek yoghurt work well. If your greek yoghurt is plain you may wish to add a tsp or two of your favourite liquid sweetener. Chia Seeds: If you don’t have them just omit them completely and add a little less milk in, or substitute for your favourite smoothie booster. Frozen VS Fresh: I prefer to use frozen banana slices in this BUT if you only have fresh on hand that's absolutely fine. Updates: First published September 27, 2018. Last updated January 14th, 2019 with new photos & tips. No changes to the recipe. Nutrition: Nutrition information is a rough estimate based on one smoothie.